Lubricants - J.M. Reynolds Oil Company, Inc.
J.M. Reynolds Oil Company, Inc.
For four generations, J.M. Reynolds Oil Co., Inc. has provided quality products and services for residential, industrial, commercial, and agricultural usage. Anyone can sell lubricants. At J.M. Reynolds, we know every customer has a unique requirement, so we go that extra step to accommodate your needs. 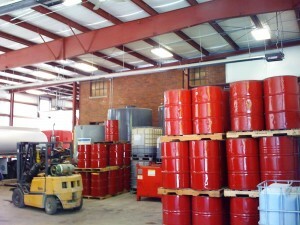 We provide fuels, oils, lubricants, and other chemicals for nearly any use imaginable. Our vast array of products features brands such as Shell, Fuchs, Safety-Kleen, Total, and so much more. We sell in sizes ranging from quart cases, pails, drums, totes, bulk, to transports and everything in between. At J.M. Reynolds Oil Co., Inc., we pride ourselves on providing hometown service along with any product you may need. Time or OEM recommended changing schedules may detract from the full value of your lubricant investment. Use our lab service to determine the condition of your lubricant and STOP REPLACING GOOD OIL! We test for the presence of wear elements that may reveal a failing component before your system fails. Let us manage your inventory and remove the worry of managing lubricant, coolant, and cleaner inventories. We can help you establish a Max/Min inventory program. We can monitor your stock to make sure you never run out. We can supply quality, reliable, field-tested equipment guaranteed to meet the demands of your business. We offer lubricant handling equipment, bulk dispensing systems, grease or oil pumps and much more! Have a question about propane? You may find your answer here. Click here to find forms to keep your account updated. J.M. Reynolds Oil Company, Inc. proudly serves Wabash, IN, Bippus, IN, La Fontaine, IN, Lagro, IN, Lincolnville, IN, Richvalley, IN, Roann, IN, Somerset, IN, and Urbana, IN for local deliveries and a tri-state area for bulk oil.